Over the past couple of years I have got to know several of Spain’s leading tailors fairly well, particularly Langa, Reillo and Calvo de Mora. Spanish tailors can be characterised as flexible and value for money, particularly given the amount of handwork involved. Their only potential weaknesses are flipsides of both those points: lacking an identifiable house style as a result of that flexibility, and concentrating on handwork rather than precision. Most Spanish tailors are small. Langa and Reillo have one cutter (Joaquin Fernandez and Jose Maria Reillo respectively – shown top, at right, and bottom of the post respectively) and Calvo de Mora has one main cutter and one in training (Manuel Calvo de Mora and his son Alberto – far left and second left above). 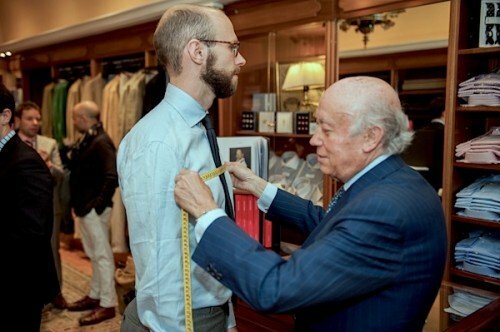 There are only two or three other tailors in Madrid (Larrainzar most notably) and few in other major cities (just one in Barcelona). Most don’t do all making onsite. This size is driven by the small market for tailoring in Spain, which in turn explains the two factors mentioned above. 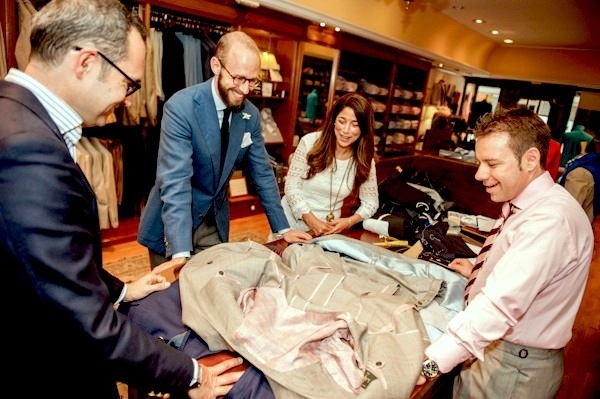 The tailors are flexible because they have to adapt to a range of clients and to changing demands. They all make a strong shoulder, a soft shoulder and a Neapolitan shoulder, for example. They are all willing to offer lined and unlined jackets, as well as fractions in between. Madrid tailors are cheap. 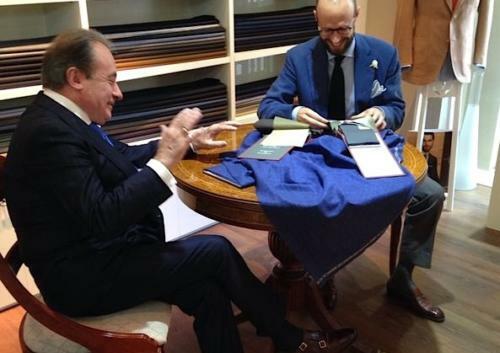 Suits cost €1800, €2000 and €2500 at Langa, Reillo and Calvo respectively, and the handwork involved is just as high as a Savile Row or Milanese suit, if not higher. The chests are all hand-padded and the collar, sleeves and so on attached by hand (of course). But the lining is also often stitched by hand and there is particular attention to detail around points like the internal breast pockets. However, now and again the precision of that handwork can slip a little. Anyone that has spent any time sewing will know that the challenge is not doing it by hand, but doing it so finely as to make it appear almost machine-made. Parisian tailors achieve this to a phenomenal level. English tailors often use sewing machines where it is cleaner and stronger than handwork. Neapolitans do a lot of handwork, but can be a little rough with the finishing. In places the Spanish can have something in common with their brethren from Naples. (Interestingly, Spanish is closer to the Neapolitan dialect than Italian, as I discovered when everyone started speaking happily amongst themselves at the latest Aristocrata meeting.) I am having suits or jackets made by all three of the Spanish tailors mentioned here, however, so I will provide ample opportunity for you to judge for yourself the quality of the work. The first should be in a couple of weeks: a brown linen suit from Joaquin at Langa. This is particularly relevant because Joaquin is the youngest of the cutters and plans to start visiting London soon, along with Mariano, the superb shirtmaker at the same house (pictured above). You can follow the discussion on Spanish tailors by entering your email address in the box below. You will then receive an email every time a new comment is added. These will also contain a link to a page where you can stop the alerts, and remove all of your related data from the site. Simon, very interesting article. Have you heard of Jaime Gallo, in Madrid? any feedback? He seems to have a good reputation (mainly through working for the new king and some notable politicians) and I was wondering it he was at the same level as the three tailors you mention here. 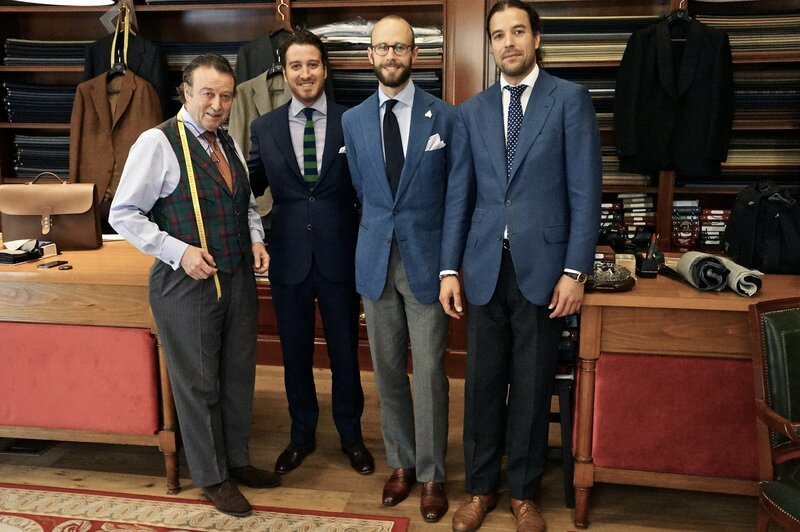 You mention that there is only one tailor in Barcelona. It is true that Barcelona has not many tailors, but as far as I know there are more than just one. Santa Eulalia has one cutter, Blasi has another one and my favourite: Oscar H. Grand, in the Born neighbourhood, a young cutter who works with some off-house tailors and is self-employed. He makes suits with good fabrics and soft paddings with a nice milanese buttonhole for less than 1.000€. ps: I visited Norman Vilalta last week and I could see the last he is working in for you, nice job indeed. Thanks Nestor. That was based on a few conversations with people in Madrid but clearly they were doing down Barcelona! Yes, pretty excited about the shoes with Norman. He is one of my favourite people in the world. Rafael: I am reselling a Jaime Gallo coat on ebay currently. Good finishing, soft construction. Never saw it on the original client, but definitely a tailor worth mentioning. Very interesting to see the comparison of prices – the linen suit will only cost you 1800 euros then? It will be fascinating to see how it “shapes up”. Thanks for the article Simon. Barcelona definitely is worth the visit, Ask for Jari at Santa Eulalia, he´s one of the cutters, young and friendly and has a great personal style. Also, would be interested to know your opinion/review on Cuervo Cobblerblack Bird handmade shoes. I’d be very interested in paying them a visit if they came to London. Their price point puts them in the same bracket as the ‘fully handmade’ option from my usual tailors at Cad & the Dandy and I suspect the finished article is likely to be far superior. Do you know when they’ll be visiting the UK and how will this be publicised? great article! What tailor or tailors in your opinion makes the best soft or neapolitan shoulder? In Naples there isn’t much to differentiate between them. Small differences in the amount of excess at the top of the shoulder, but that’s it. They all do that shoulder, and others outside Naples try to. Sounds like I can’t go wrong with Solito for bespoke or Orazio Luciano for mtm. Versatility/flexibility is great, I will agree, but is there something lost in quality? For instance, going to a Spanish tailor (or one from Northern Italy) for a Neapolitan shoulder, as opposed to just going to a Neapolitan tailor. Sometimes, yes. I’ll report back on that. Although with something like that shoulder it isn’t necessarily worse quality. Merely different. What are you wearing in the photos? Hi Simon could you talk me through what you are wearing in the second photo. Looks superb. Hey Jon – see reply posted on comment above, plus you can also see here: grey fresco trousers from Gieves & Hawkes and Gaziano & Girling bespoke slip-ons. I have a question remotely related to Spanish tailors, although more about warm weather fabrics than anything else. I’m getting a suit made, Sicilian style, light with minimal lining, something I can easily wear during spring / summer. What sort of fabrics / weight would you recommend? That’s a big question, and is largely dependent on what you want the suit for. Lightweight or tropical worsteds will do well for business wear. Fresco is worth a look for a sharp, elegant line without sacrificing breathability. Linen is king of the summer fabrics, though I’d go heavy and Irish with it if you can. And the wool/linen/silk mixes from the Italian bunches are worth looking at, though they tend to have less body and shape. Hope that’s a start. Have a look round the site for some of these subjects and you’ll find more information too. Thanks for the reply Simon. I’d say it’s required to be semi-formal, it is for a wedding (like most bespoke suits ordered for the first time), with the intention to wear it normally, so I’d rather have something pretty ‘relaxed’ cut wise and more universal than super formal. Anything you’d recommend weight wise? I’ve got no experience with fabric weight, so even a ballpark figure would do for something suitable for the summer season. I’m looking at a two piece suit with minimal lining / padding. I was thinking light wool, maybe as a mix with silk depending on the manufacturer (which is another question altogether). Cheers Simon, will be going with Fresco, probably Minnis, already order some samples in 9/10oz, navy / blue which will hopefully hit the jackpot. I recently moved to Madrid and am wondering where to start for classic custom suits and shirts. I am looking for RTW or bespoke but want to get all the basics at one place. Are you able to recommend Langa, Reillo or Calvo de Mora yet? Did all of them speak English? Also, did you happen to come across any stylists in Madrid that you can recommend? I am looking for an update on Pierce Brosnan’s Thomas Crown style (Campagna) and someone to help me chose the fabric, color, etc. Do you do this type of consulting or know anyone who does? I can’t speak to the full process at any of the tailors yet, but they could certainly all deal with your bespoke needs. Langa is the only one with some RTW wear, but it is limited. Unfortunately Mariano (the shirtmaker at Langa) is the only one who speaks English. Joaquin there is learning, and the Calvo de Mora sons also speak a bit of English. I have done a consulting service for a few people over the years, particularly around creating a bespoke wardrobe. Feel free to contact me separately for details. who also offer some bespoke tailoring services ? Simon, I think you have the rationale behind hand sewing/finishing back-to-front. The challenge is not at all to make it look like it was done by machine; rather it is to produce neat hand-sewing. There will be (and always have been) minor irregularities in hand sewing, it is referred to as the ‘charm’ of hand finishing. The uniformity of machine sewing is most often used where it is unseen: pockets, long seams… The over-familiarity with machine sewing seems to make people think hand-sewing is sometimes below par. It’s not, it performs other functions in addition to merely joining the cloth. I’m not sure how that can be known, since different tailors hand or machine sew different parts. The aim is still not to imitate a machine stitch. A machine stitch is for speed and uniform strength where required. In our workshop we use it on inner pocket construction (though not everywhere), some long seams and other bits. Hand-sewing is the same as it was before the invention of the machine, the latter was the imitation. Which is why I said you have it back-to-front, but I see you won’t relent because you are now an expert. Thanks Roger, happy for you to have your view. Different tailors of course make different ways, but given that I’ve visited about 50 of them, and watched my own things made at 25, I know more than most. They are not imitating. But the neater they become, the more they look like machine stitching. I’ve seen about 20 different concert pianists at work in my life; close up. Have I a better perspective than someone who’s never been to a concert? Most likely, but unless I’ve sat on the pianist’s stool as long as he has I’m willing to say my outside view is not quite the same as the inside view. Am Getting married on November 7 2015. Not sure what to wear but more inclined to a tuxedo. Am planning to fly to Madrid and have my suit made there and price range between €2000-25000. What would you suggest in terms of color and style ? Thank you for your reply and advise. Could you provide a link for me to see what are you referring to? Am open to suggestion, just want to look sharp and cool, nevertheless, be the star of the show, either om legal weeding and most importantly on church. I need two suits. I’m on my way to barcelona and would like to buy fabric for a tuxedo. What in your opinion would be the best place to source this? Hi everyone I’ll want to kindly as for an information about the Spanish tailor specifically in Madrid because I live here, I love fashion designer and I have idea about the job,I want to live my life as a style.if someone can help me with an addressee for the best Madrid Tailor’s I’ll be gladly.